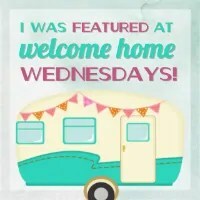 Welcome to Welcome Home Wednesdays #85!!! Yeah, it’s Spring Break here!! I’m off enjoying some much needed sunshine. Enjoy your week! Here’s some sunshine for you – If you want to put an extra $100 in your pocket, ENTER TO WIN $100 Amazon Gift Card Here. 8 Gals, 8 Blogs & 1 Great Party! Link up once to appear on 8 Amazing Blogs! Like any good hosts we’re sitting right by the present table waiting until our guests leave so we can go through the loot… the loot being your Welcome Home Wednesdays #85 links! We can’t wait to check out what you’ve left for us. Trust me there will be a lot of pinning, tweeting and facebook sharing going on in the near future… we can’t wait to show off what you’ve left! Thank you for featuring my pudding recipe this week! Of course!! Thanks for coming by every week and partying with us. You have great projects! Thank you for featuring my DIY Industrial Printer Cart this week! It’s a great DIY! Thanks for linking with us! Enjoy your week! You’re welcome! Thanks for partying with us! Have a great week! Thank you for hosting again this week! Hope you have a great day! Thanks! You too! See you next week! Thanks so much for featuring my Easter cupcakes! My pleasure! So cute. The perfect addition to Easter brunch! Hi Marilyn! Thanks for coming by each week and bringing your smiling face and tasty recipes!